Tamil films are not unfamiliar to Tollywood star Jagapathy Babu. The actor made his debut as the bad guy in the Arjun-starrer Madarasi a few years ago and was well received by Tamil audiences. Now, Jagapathi, who has completed a hundred Telugu films, is being roped in by director Vijay for his upcoming flick Thaandavam, which features Chiyaan Vikram in the lead. The film has already an ensemble cast of Vikram, Anushka Shetty, Amy Jackson, Santhanam, Nasser and now Jagapathi Babu.Though Vijay is tightlipped about Jagapathi's role, all he'll say is that he is the second hero and a powerful character. 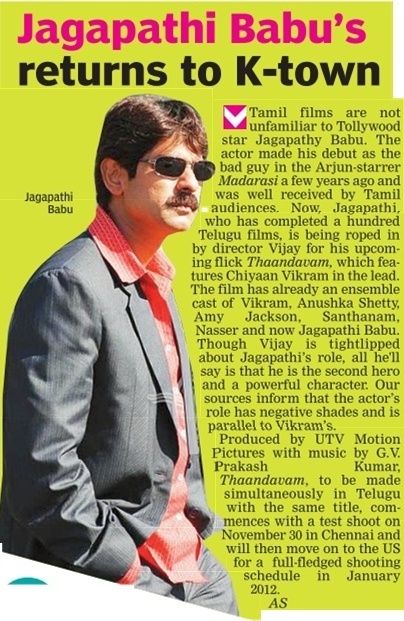 Our sources inform that the actor's role has negative shades and is parallel to Vikram's. Produced by UTV Motion Pictures with music by G.V .Prakash Kumar, Thaandavam, to be made simultaneously in Telugu with the same title, com mences with a test shoot on November 30 in Chennai and will then move on to the US for a full-fledged shooting schedule in January 2012.